This will walk you through the necessary steps for creating widgets on your dashboard. A widget is a graphical or numerical representation of your data displayed on your Dashboard. Widgets give you the ability to see snapshots of your data when you login. To access the Widgets, click on the "Dashboard" tab at the top of the browser. To add a widget, click on the green "Add Widget" button in the top right hand corner. Select which category you would like displayed on your Dashboard from the drop down. This drop down will include all the default categories and any custom categories you have created. 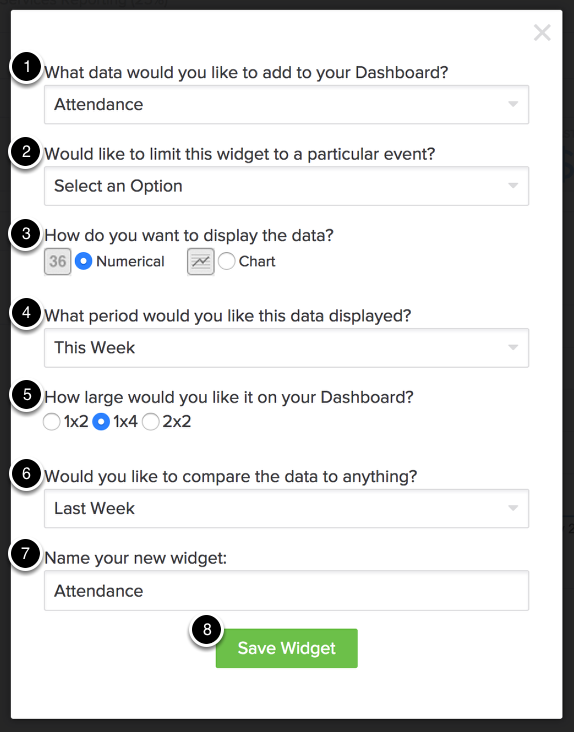 Select Event allows you to isolate your widget to a single event. If you have created Events, this might be useful for you on your dashboard. Picking an Event is not required. Numerical or Chart will determine how your data is displayed. "Numerical" will display your data in number form and "Chart" will display your data on a line graph. There are a few options when selecting the display range for your data; "Year", "Month", "Week". The Dashboard is laid out in a grid, each size takes up different amounts of the grid. "2x4" is the smallest and "3x6" is the largest. If you select "1x4" you will have the ability to compare to a previous time. If you chose "1x4" you will be able to compare your data to 3 different times. "Last Week", "Last Year" or "Last Week and Year"
Naming your Widget is a quick and easy way to identify your widgets.